When it comes to notebooks from Sharp, most people will instantly think of portability. It is correct that Sharp has made quite a few quality slim notebooks and earned itself great acclaim. What is less known, however, is that Sharp has also manufactured some quality HPCs that feature both slimness and performance. A case in point is HC-VJ2C, the Japanese version of the famous Intermec 6651. Today, I will talk about an earlier Sharp HPC - HC-AJ1 (referred as AJ1 hereafter) that also is easy to carry, but difficult to beat. Sharp manages to pack an 8.4-inch TFT screen, USB host, 56K modem, CFII and PC Card type II slot, infrared and serial synchronization port in to a 820-g beauty of AJ1 (detailed specifications available at the notes). This is really something. 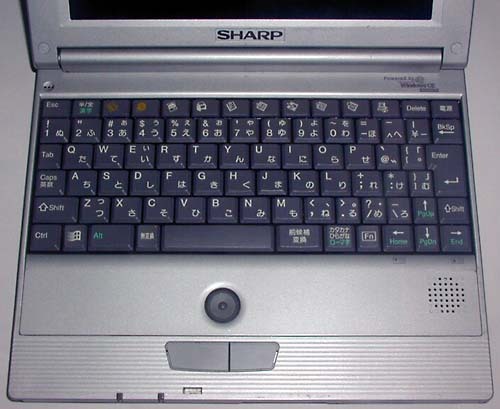 Sharp is a world famous LCD maker. This is probably no coincidence that it chooses to deploy a gorgeous 8.4-inch 800x600 TFT screen in AJ1 in 1999, when no other HPC Pro machine ventured to follow. JVC used the same design on its MP-C303 later in late 2000 and a TFT screen only landed on NTT DoCoMo S3 as late as in August 2003. AJ1's screen is not only beautiful, but also big. Its viewable area measures 172x129mm and you can surely enjoy reading your favorite novel on AJ1 the easy and comfortable way. 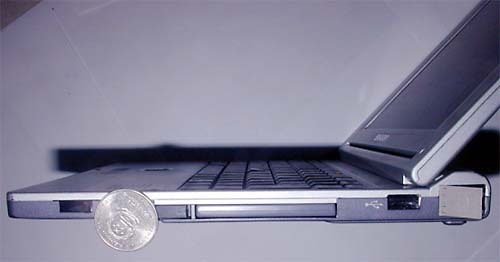 With the screen unfolded, HC-AJ1's base (keyboard part) is only 12mm thick, about half of a Chinese coin’s height. Sharp also did a good job in keep the weight balance between the screen and the base. Holding AJ1 with one hand is very comfortable. I like reading e-books before going to bed. Then AJ1 is always my first choice though I have several HPCs and PPCs. AJ1 has a larger screen and better readability. I can well hold AJ1 with the right hand and scroll the pages with the direction keys just under my thumb. My hands will not get tired soon and it is a perfect e-book experience. Unlike most other HPCs, AJ1 is powered by a Toshiba MIPS TX3922 129Mhz CPU. Its core is the MIPS R3000 series, different from those R4000 CPUs used by NEC HPCs. Though slow in CPU clock, AJ1 could be one of the fastest HPC Pro machines. I once owned an NEC 730F, the Japanese version of NEC MP880 with a 168Mhz VR4121 CPU. Nonetheless, AJ1 easily outperforms 730F in almost all daily operations. AJ1 simply does not have that kind of sluggishness I experienced on 730F. The initialization time of major applications like Pocket Word, Mdict and Total Commander is shorter than that on 730F. The BMQ benchmark results proof that if you compare them to other devices' results in the chart on this site. Toshiba CPU has a powerful multimedia engine. Part of the reasons that I bought the NEC was to make presentations and demonstrate pictures. Unfortunately, 730F was slow in this regard. For me, it is like waiting for 730F to work rather than using it for work. In the end, I had to give up. On the other hand, AJ1 gave me another kind of multimedia experience. With the great photo viewer, Pocket Quick View 3.0.7, AJ1 displays a 653kb 1152x768 Jpeg file in about 2.6 seconds. TCPMP version 0.66e displays the same photo with slightly more time. As if to emphasize its multimedia power, Sharp even included a MPEG player in the ROM. Of course, it can only handle 160x160 files and is surely no match for TCPMP in 2005. AJ1 includes a standard battery rated at 1500mAh. A TFT screen consumes much more power than STN or DSTN display panels. To my surprise, however, AJ1's battery simply lasts long. With the backlight set to the third lowest point, my two second-handed AJ1 batteries respectively last 4 and 4.5 hours. The test conditions are: PIM operations, e-book reading, little word processing using keyboard (this eats much power) and sometimes viewing photos from internal CF slot (drains battery too). I am very pleased with such a battery performance. 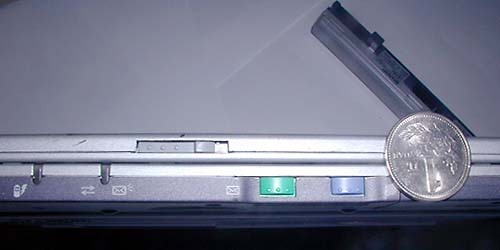 Though this thin and light, AJ1 still has a few design positives: the speaker is located on front side below the keyboard, instead of the bottom side as in other HPCs where the music is severely cancelled when placed right on the desktop. Sharp does not miss out the microphone as NTT DoCoMo S2 does. In addition, it is placed right above the keyboard. This design may help a lot if the user often needs to record his or her own voices. Also below keyboard is the optical pointing device and the left/right buttons because HC-AJ1 does not have a touch screen. Besides HC-VJ1C and HC-VJ2c (respectively the HPC Pro and HPC2K Japanese version of Intermec 6651), none of the entire AJ series - including HC-AJ1, HC-AJ2 and HC-AJ3 - is equipped with a touch screen. Instead, a touch panel is installed on these models. The only difference is that newer models like HC-AJ2 and HC-AJ3 deploy better and improved touch panels. 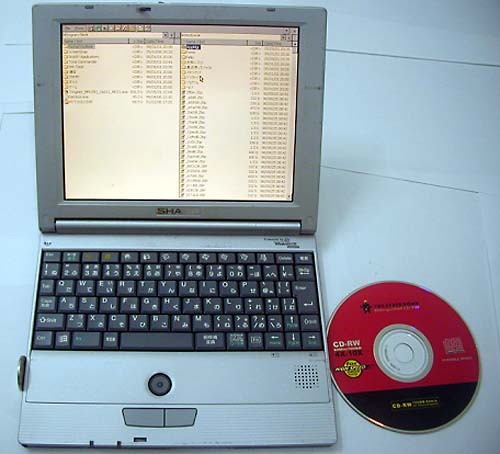 Besides these Sharp products, the only HPC without a touch screen I know of is the short-lived IBM WordPad Z50. According to Sharp, AJ1 has a key pitch of 15 mm. typing English on it is quite good. But there always seems to be some noises when typing on the keyboard. I don’t think this issue is due to the fact that my unit is a second-handed one. It could have something to do with the design. There might be insufficient damping parts under those small keypads. AJ1 has another human touch feature: the palm-rest area below the pointing device. This area has a few grooves that will increase the friction and the users hand will not slip on the surface. Two buttons stand on the right side of the charging and email notification LEDs. The blue button is for one-click web access while the green one is for emails. When AJ1 is turned off, you can still press these buttons and AJ1 will automatically turn on, open Pocket IE or check your emails. Before that, you should set your network connection through the wizard programs from Sharp. In addition to the standard Wince 2.1x OS, Sharp has also installed some value-added software: MPEG player, PC File Viewer (OEM from Inso Outside In Viewer technology), Photo viewer/editor and camera software as AJ1 supports Sharp CE-AG03 add-on digital camera. HC-AJ1 is an angel from Sharp. It is thin, light, fast and powerful compared to those usually bulky and slow HPC Pro machines. For only 810 grams, you will get an 8.4-inch glamorous TFT screen, USB host, 56K modem, CFII and PC Card II slot, infrared and serial synchronization port. Its keyboard is good enough to complete a whole novel, but in English only. I have completed all my three reviews on Celux 300HC, Sigmarion 2 and this one on HC-AJ1 on this incredible machine and its marvelous keyboard. It is quite a comfortable experience. Inputting Chinese on this keyboard (or HPCs in general) is a bit clumsy and I seldom do this. I would even recommend HC-AJ1 over Intermec 6651 and even Sigmarion 2. The not-as-good-as-expected HPA screen on S2, in a certain sense, wastes the great CPU power and the separate video card MediaQ 200. Though with HPC2K OS, Intermec 6651 is not much faster than my 32M AJ1. In fact, their speed is almost identical. 6651 is also thicker and somehow more bulky than AJ1. Someone may argue that HPC2K has more software choices and better Pocket IE. This could be the case for English users. But for most of the time, I browse Chinese web sites. Neither of the Pocket IE on HPC Pro or HPC 2K can handle these double-byte web pages loaded with tons of flashy ads, ActiveX effects or Flash. Both fail in this aspect. So my rating for HC-AJ1 is two thumbs up. I have several HPCs and PPCs, but I use AJ1 for most of the time. The only thing Sharp forgets on AJ1 is probably the headset Jack. With it, I can listen to music while reading e-books. But, how could you ask for more with such an angel? * The standard RAM size of HC-AJ1 is 16mb. Some units on the market seem to have been upgraded to 32mb. Better find a 32mb version. I have two units: one with 16mb, the other with 32mb. For software tips, please also read my review on NTT DoCoMo Sigmarion 2. Except those software specifically demanding HPC2K OS, S2 and AJ1 share the same kind of software. An extremely fast and powerful photo viewer. It runs fast on AJ1, and possibly other HPCs. You can not afford to miss it! Namentlich gekennzeichnete Anwendertestberichte geben ausschließlich die Erfahrungen und Meinungen des Autors wieder.